Retiring champion Luke Ball reflects on an outstanding playing career that included a premiership, club captaincy, a best and fairest and All-Australian selection. Retiring champion Luke Ball reflects on an outstanding playing career that included a premiership, club captaincy, a best and fairest and All-Australian selection. Luke Ball was a key member of Collingwood's famous 2010 premiership triumph. One of the grand careers of the last decade is about to draw to a close, with Luke Ball choosing to retire at the season’s end. With back surgery required for Ball to play on in 2015, the decorated midfielder has opted to step away from the game he graced with power, strength, ball winning ability, selflessness and great dignity for the best part of 13 years. The need for a post-season operation became apparent this week. Ball met with Collingwood senior coach Nathan Buckley on Wednesday and afterwards, with a compromised pre-season on the horizon and the reality of fewer opportunities in 2015 made plain, thought differently about his initial ambition to continue. “I still have the competitive will to play on but the team is evolving and physically I know I need everything to go right to meet my expectations and the standard required by the team,” Ball said. “To be honest, I’m at peace with the decision. If I step back and consider the sweep of my career, I’ve got so much to appreciate and be thankful for. I’ve had great fun, met all sorts of people, made some wonderful friends, been challenged by disappointments and injuries and derived enormous satisfaction from competing and striving for success. Ball has married his elite playing career with senior positions within the AFL Players Association, of which he is current president. The 30 year-old is open to the possibility of continuing to work for the AFLPA in 2015. At the forefront of the celebrated 2001 national draft, Ball’s name and that of Luke Hodge (pick one) and Chris Judd (pick three) have been mentioned in the one sentence ever since. There has never been a more distinguished draft trio. Like Hodge and Judd, Ball played in a premiership, won a best and fairest award and All-Australian jumper and had the honour of captaincy bestowed upon him. He received the latter three distinctions with St Kilda inside the first four years of joining the club. 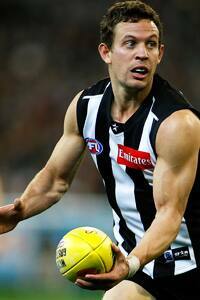 He became a premiership player with Collingwood in 2010, poignantly at the expense of his former team-mates. As he did with St Kilda, Ball immediately distinguished himself on and off the field with Collingwood. His dedication, discipline and consciousness of team made him an obvious leader, such that he was voted Collingwood’s equal best finals player in the premiership year of 2010 and quickly invited to stand by captain Nick Maxwell’s side as one of his lieutenants. He has been a leadership figure, at two clubs, for the best part of 10 seasons. “It was always going to take a train to stop him, and in the end, it did,” Collingwood senior coach Nathan Buckley said. “You could never ask for more from ‘Bally’ in terms of his preparation, the example he sets, the standard he holds himself to and the effort he brings. Ball will play his 223rd match tomorrow night, against Hawthorn at the MCG.